Do you have neck pain and disc problems etc.? Are you not comfortable with a home traction or neck traction did at clinics? If so, you should buy a traction neck pillow. This gives you relief from neck pain by gently stretching your neck muscles. You can get good relief and good sleep without any discomforts of traction. You can also get rid of snoring while sleeping. The most popular among the best pillow for neck problems is Arc4life’s Cervical Linear Traction Neck Pillow because it has several unique features. What do the buyers say about this product? Where to buy of Arc4life’s Cervical Linear Traction Neck Pillow? It works in several ways to keep you healthy, relaxed and comfortable. It enhances circulation of blood to your head and other parts of the body. Increased blood circulation is sure to improve your overall health. It ensures an uninterrupted flow of air. This helps in getting rid of snoring. It helps in correction of posture. This gives relief from neck pain and muscle spasm. 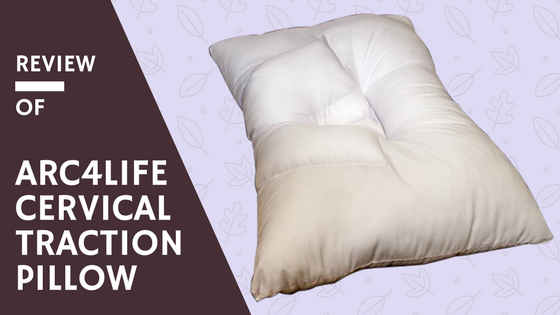 The cervical pillow from Arc4life is divided into 2 parts. The first one is the “traction” side or the “V” side. The ‘V’ shape is the part that cradles your head and keeps the head at right height from the mattress. This relieves the stress laid on back and shoulders while sleeping. The support or role side supports your head and neck. You can either have the “V” shape at the bottom or the “roll side” at the bottom. The choice is yours. Some of the pillows are made exclusively for side sleepers and some for back sleepers. The plus point about this pillow is that it can be used both by side sleepers and back sleepers. Moreover, it is available in medium and large size. The medium is the standard size and suitable for petite people and the large is meant for people of large size. 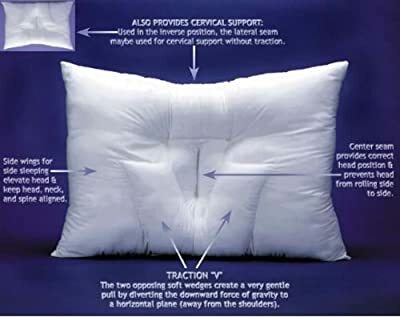 This pillow works for conditions like arthritis in the neck, disc problems, spinal degeneration, military spine, chronic neck pain, Occipital neuralgia, headaches and whiplash etc. It is no wonder that it is used by chiropractors and other health care professionals. 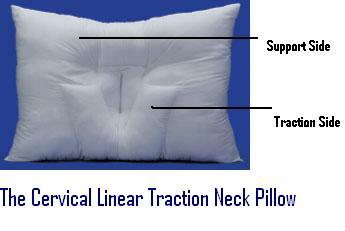 A customer says that he had a bulging cervical disk problem and he had 100% relief after using this pillow. He is happy that he was able to get rid of his pain without spending a lot of money to get treatment from doctors and physiotherapists. Another customer, Kevin Kelly, says that he has had a stiff neck for several years. He tried many pillows but none of them worked for him. This cervical neck pillow from Arc4life has helped him to get complete relief from a stiff neck. Most of the customers feel that this is outstanding. 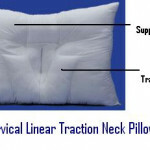 They say that they can’t believe that this pillow treated their neck pain. There are a few negative reviews too. One of the customers feels that the quality is not up to the mark. He says that he doesn’t like the hand stuffing. Another customer says that it hurt his back. But for a few complaints, the product has received ‘thumbs up’ from many buyers. This pillow can be bought online without stepping out from your home. If you are looking for a reliable source to buy this product, there can be no doubts that Amazon is the right place. You are assured of lowest price and fast delivery. Buy from Amazon for a stress-free buying experience.